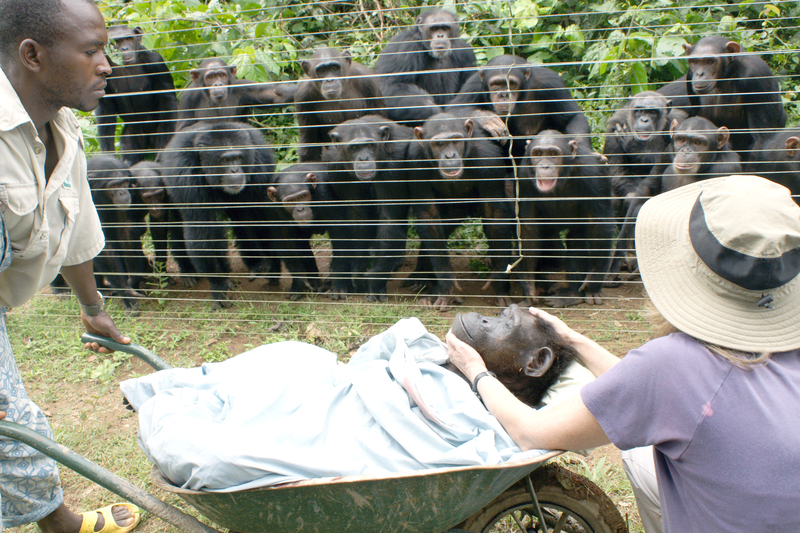 Chimps seeing Dorothy’s body a final time, with Dr. Speede. Posted on September 15, 2013. Bookmark the permalink. Leave a comment. Moabi, Bikol, Jacky, Mowgli, Simon and Njabeya vocalizing at the Sanaga-Yong Rescue Center in Cameroon. Baati with Kanza at Sanaga-Yong Rescue Center in Cameroon. Arvid at the Sanaga-Yong Rescue Center in Cameroon. Carla at Sanaga-Yong Rescue Center in Cameroon. Bouboule at Sanaga-Yong Rescue Center in Cameroon. Kiki Jackson at the Sanaga-Yong Rescue Center in Cameroon. Niete at the Sanaga-Yong Rescue Center in Cameroon. All who read this book will be deeply moved. How fortunate for Dorothy and the other orphaned, captive chimpanzees — and for those of us who care about them — that there are people like Sheri Speede who risk their health, and work for a pittance, to rescue them. Sheri's words will bring a tear to all but the hardest of hearts. And a lot of smiles as well.